Ice melter, salt, and other toxins. Many people will put ice melter or salt on walkways to prevent slips and falls, but these products can wreak havoc with your pet’s paws. Prolonged exposure can lead to chemical burns on your dog’s paws. If your dog suddenly becomes lame during a walk, de-icing products, such as salt could be to blame. Try to walk your dog on grassy or snowy areas rather than sidewalks or roads. Once your pet comes inside, wipe down his paws, legs, and belly to remove any de-icer, salt, or antifreeze that he may have picked up while outside to prevent ingestion of these offending products. Consider using booties on your dog or applying protective wax to your pet’s paws. Ensure the booties are a good fit. Ice balls/snowballs. Another cause of sudden lameness on a walk is the accumulation of ice balls that form between the pad and toes of our furry friends. You can reduce this accumulation by keeping the fur between the toes trimmed short throughout the winter, or by using booties. Icy/snowy sidewalks. Our furry friends may find it difficult to walk on snowy or icy sidewalks, especially arthritic and elderly pets that may be more inclined to slip and fall. Avoid icy patches on your walks if possible. Feeling the cold. Short-haired dogs feel the cold faster than long-haired dogs, but that doesn’t mean that long-haired dogs can stay outside in cold weather. During cold spells, dogs and cats should be kept inside, as they can get frostbite and hypothermia despite their fur coat. Dogs bred for colder weather (Huskies and Alaskan Malmutes, for example) can tolerate the cold more because they have a naturally large undercoat of downy fur, but should not be left outside for long periods, especially if windy. 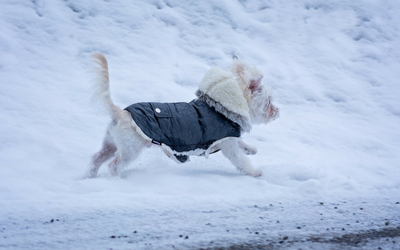 Dogs with short legs tend to have their bellies touching the snow, so putting a coat or sweater on him is a good idea! Make sure that the coat or sweater is dry before putting it on your dog – wet coats do not provide warmth and will make your dog colder. Shorten the walk. In cold weather shorten the length time that you are outside with your dog. Instead of going for one long walk or having a long play session at the dog park, consider taking your pet for shorter, more frequent walks. During extreme cold snaps, your pet will benefit from longer play sessions in the house and very short outings for elimination only. Pets with underlying health problems may have a hard time regulating their body temperature in cold weather. The same is true for very young and very old pets. Pay attention to your pet’s tolerance to the cold and adjust your time spent outside. If you notice that your dog or is cat shivering or crying, or holding up a paw, it’s time to get back into the warmth of your home. Cars. We are all aware of the dangers of keeping our pets in a hot car during the summer months, and the same dangers exist for keeping your pet in a cold car. It does not take long for a car to cool off in extreme cold. Never leave your pet unattended in a car – leave him at home. Outdoor cats will sometimes seek refuge under the hood of cars, looking for the warmth from the engine. Before starting your car, make some noise by banging on the hood of your car or honking the horn to startle potential interloping cats away. Make sure you give the cat time to get away – cats can tuck themselves into tiny corners and may need some time to get out. Diet. In the winter months, many pet owners will feed their pets a little extra food thinking the extra weight will help their pet stay warm through the long cold winter. In fact, because many pets get less exercise in the winter months, they might need to be fed slightly less! Check with your veterinarian to make sure your pet is the ideal weight, as extra weight can lead to health problems. Frozen lakes, rivers, and ponds. Avoid letting your dog off leash near frozen lakes, rivers, and ponds. It is difficult to know if the ice is thick enough to support your dog’s weight. If your dog breaks through, it will be your instinct to attempt a rescue and the consequences could be deadly for both of you. Antifreeze. Clean up any antifreeze spills (or any other chemical spills). Antifreeze has a pleasing smell and a sweet taste, but its consumption can be deadly even in very small quantities. Clean up any spills from your garage or driveway and keep pets away from these areas. These tips will help you and your pet enjoy the snowy winter months safely!